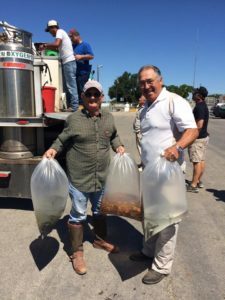 Stock My Pond visits Jacoby Feed & Seed on Wednesday, October 9th between 11:00 am and 12:00 pm. The truck will have channel cat, large mouth bass, black crappie, bluegill, hybrid bluegill, red ear bream, and fathead minnows. Find out what type and size fish we offer on our website. The truck provides containers for all fish but the 11″ channel cats, so please bring your own containers for them. Looking for Pond Stocking in Jacksboro, TX? Stock My Pond visits Thornton Feed Mill in Jacksboro, TX. The truck will have channel cat, large mouth bass, black crappie, bluegill, hybrid bluegill, red ear bream, and fathead minnows. Find out what type and size fish we offer on our website. The truck provides containers for all fish but the 11″ channel cats, so please bring your own containers for them. Stock My Pond visits Throckmorton Ag in Throckmorton, Texas. The truck will have channel cat, large mouth bass, black crappie, bluegill, hybrid bluegill, red ear bream, and fathead minnows. Find out what type and size fish we offer on our website. The truck provides containers for all fish but the 11″ channel cats, so please bring your own containers for them. Looking for pond stocking in Tuskegee Alabama? Stock My Pond visits Vaughan’s Feed Store. The truck will have channel cat, large mouth bass, black crappie, bluegill, hybrid bluegill, red ear bream, fathead minnows, and grass carp. Find out more on our website. The truck provides containers for all fish but the 11″ channel cats, so please bring your own containers for them. Stock My Pond Visits Wilsonville, Alabama at Coosa Valley Milling. The truck will have channel cat, largemouth bass, black crappie, bluegill, hybrid bluegill, red ear bream, and fathead minnows. Find out what type and size fish we offer on our website. The truck provides containers for all fish but the 11″ channel cats, so please bring your own containers for them. Now is the time to stock your pond or lake. It is not necessary to pre-order the fish, but if you are looking for a large quantity we suggest you call. Have questions, give us a call Stock My Pond at 501-676-3768. Soon there will be a Stock My Pond Fish Truck In Abbeville, AL. The truck will visit CD’s Feed and Seed. The truck will have channel cat, large mouth bass, black crappie, bluegill, hybrid bluegill, red ear bream, fathead minnows, and grass carp. Find out more on our website. The truck provides containers for all fish but the 11″ channel cats, so please bring your own containers for them.